A new energy supplement has been developed for students by third-year Wilfrid Laurier University student, Andrew Stubbs. 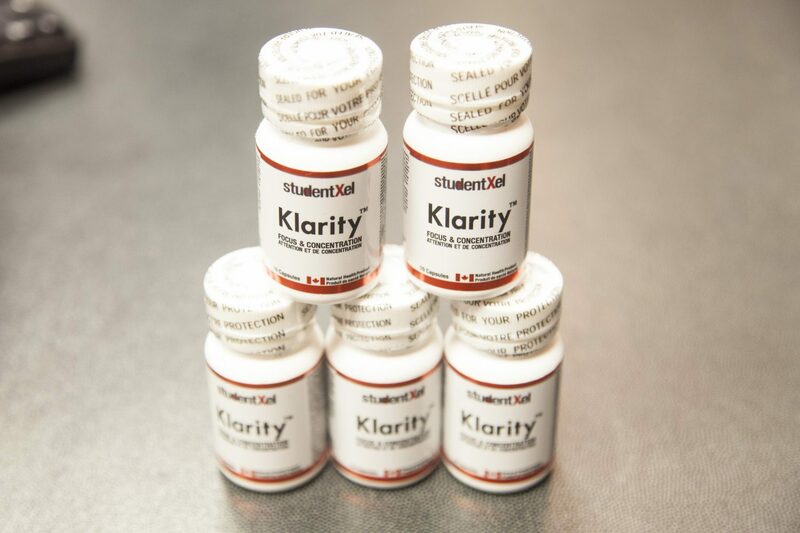 ‘Klarity’ is a Health Canada approved natural health product, developed and sold through studentXel. Klarity was approved by Health Canada on Aug. 15. Stubbs is the founder and CEO of the company, which also works with brand ambassadors at the University of Waterloo and Laurier to sell the product. Klarity aims to help students focus and concentrate better and increase their overall efficiency. The product itself is made from a combination of caffeine, L-Theanine, L-Tyrosine, vitamin B3 (niacinamide), Panax ginseng root, vitamin B12 (cyanocobalanin) and hypromellose. “The stimulants in Klarity are caffeine, ginseng and L-Tyrosine and then the calming factors are L-Theanine and niacinamide. So basically the research that I did … is that when you combine caffeine and L-Theanine, it gives you the effects of caffeine without jitters or crash,” Stubbs said. Klarity was developed by Stubbs and partnering pharmaceutical companies because of his experience in his first year of university with students who abused prescription drugs like Adderall and Ritalin. “When I was in first-year, I was at Spruce Street residence … and pretty much, prior to each midterm, I would see a lot of students snort Adderall, snort Ritalin. So I was like, you know what? First of all, that’s a problem … so I thought to myself, there has to be a mainstream way of taking pills, but in a safe, effective way,” Stubbs said. StudentXel also promotes what it calls the ‘studentXel Lifecode.’ Among other things, this code encourages students to exercise at least three times per week, aim for eight to nine hours of sleep each night and try meditation to boost their productivity. Health Canada itself encourages healthy dietary, exercise and sleeping patterns. People are encouraged to meet their nutritional needs, primarily through a healthy diet, as described in the Canada Food Guide. Klarity is sold on the Laurier Waterloo campus, where Stubbs himself delivers the supplement. Other participating locations in Waterloo and Toronto also sell the product. The future of studentXel could involve creating products that could potentially treat hangovers, help students with presentation anxiety or help students sleep, according to Stubbs. caffeine, L-Theanine, L-Tyrosine, vitamin B3 (niacinamide), Panax ginseng root, vitamin B12 (cyanocobalanin) and hypromellose. – always do your own research before ingesting anything.